Our color spotlight of the day is… Santa Cecilia granite! This stone originates from the mines and quarries in Brazil and is as old as you can imagine. It is named after St. Cecilia, the patron saint of church music that brings beauty to the ears of all. While this stone doesn’t bring beautiful music, it does however bring an undeniable beauty in the stone colors. Santa Cecilia granite is known for its soft beige colors with random specks of brown, black and gray. It has established a name for itself among designers because of its durability, strength, and beauty. Its natural density can withstand most elements and pressure, which is why is highly recommended for both indoor and outdoor projects. This variation is also known as Latin Pearl or Samoa Light granite. This stone features a more consistent pattern throughout the slab. If you look at it closely, you’ll see very defined accents of black, gold, and brown. This color is extremely versatile and can blend well with most surfaces. This variation actually falls under the category of gold granite because it has several tones of yellow and gold colors. This color paired with cream or beige wood cabinets is the perfect choice for your countertops if you want to achieve a dramatic look for your kitchen or bathroom. Unlike the first two variations, this granite is mainly composed of a mixture of white and gold colors, with white being the more dominant color. This is a fabulous choice if you want a classic look to your kitchen countertops. You can also pair it with either light or dark wood cabinets, depending on your design style and taste. 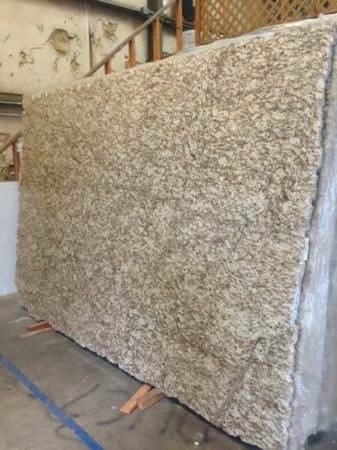 We have many variations of Santa Cecilia granite in stock! Visit our warehouse or call us to reserve a slab today!